MipScope's source code is managed by Git. 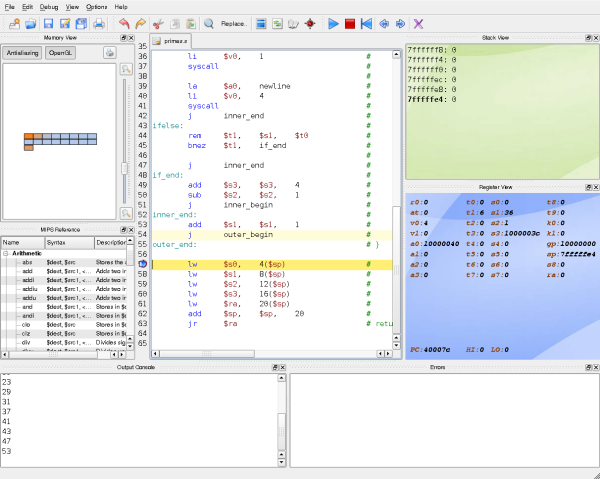 MipScope is a cross-platform Integrated Development Environment (IDE) for students learning MIPS r3000 / MIPS32 assembly programming. 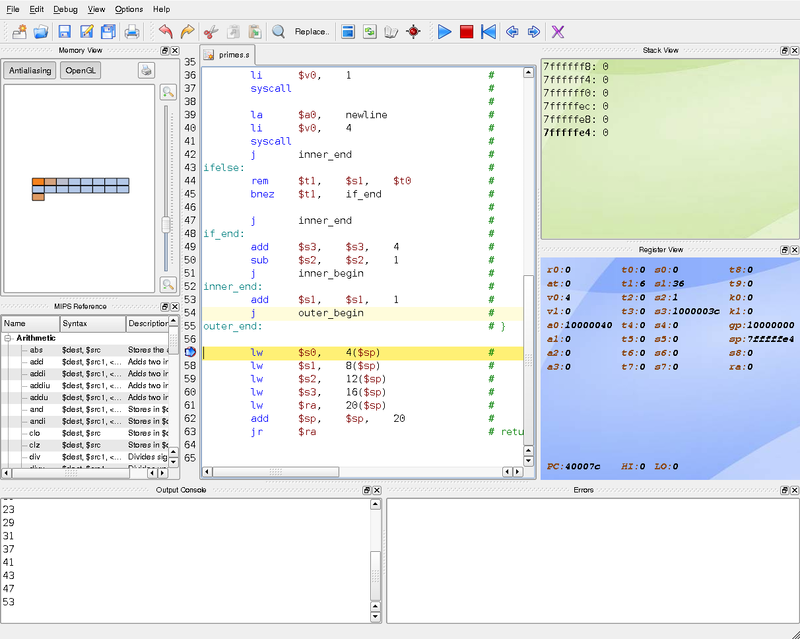 It features an editor with an integrated MIPS interpreter and debugger. The focus is on helping beginners write and debug meaningful programs quickly. MipScope was designed to replace the SPIM simulator in Brown University's Introduction to Computer Systems course. MipScope implements most of the r3000 and MIPS32 specifications. Floating point operations, exceptions, and self-modifying code aren't supported at this time. MipScope uses the QT framework, and runs on all platforms supported by QT. This includes Linux, Windows, and OS X. Builds are provided for Windows and OS X.
MipScope is dead software. From 2007 to 2011, it was used successfully by hundreds of students in Brown's CS31, although it is still very young software and contains several bugs and rough spots. As of 2012, CS31 has been abolished and since MipScope never gained traction outside of Brown, it will likely never again see active use or development. If you are interested in MipScope, we'd love to hear from you. Drop us a line at mipscope@cs.brown.edu. Bug reports, suggestions, and patches (or pull requests) are also welcome, though we can't guarantee they'll be handled in a timely fashion. MipScope is free and open source software, licensed under the terms of the GNU General Public License v2. MipScope comes with NO warranty; not even for MERCHANTABILITY or FITNESS FOR A PARTICULAR PURPOSE.